The expansion will feature 135 new cards and two new keywords: Rush and Echo. Rush lets a card attack the turn it is played, but the card can't attack heroes that turn, while Echo lets you continue playing the same card as long as you have the mana to play it again. 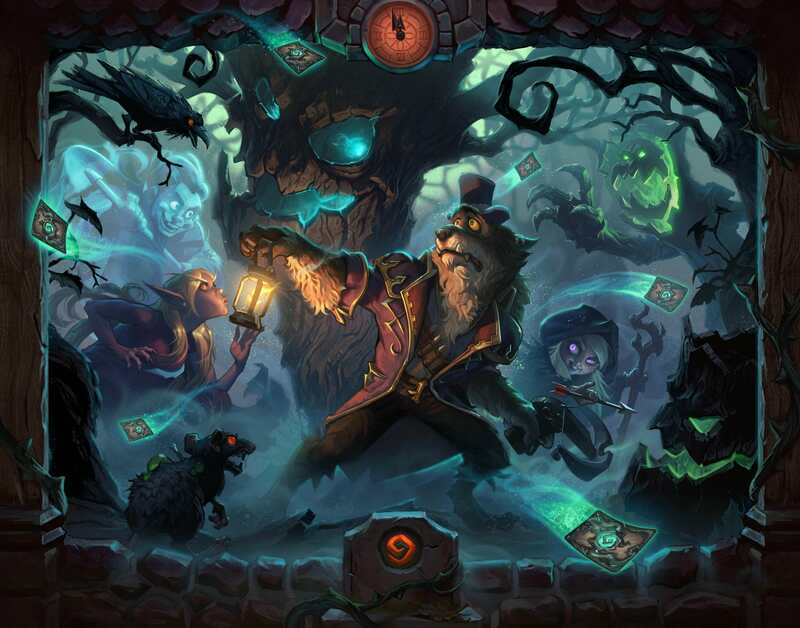 There is no set release date for the expansion yet, but it will release in mid-April, and when it hits, Whipsers of the Old Gods, One Night in Karazhan and Mean Streets of Gadgetzan will rotate out of the standard format. The new single-player mode will be a new form of Dungeon Run called Monster Hunt that will feature four single-player-only classes. Players who log in when the expansion launches will receive three free packs and one free class Legendary. Wing Blast: 4 Mana Hunter rare spell. Deal 4 damage to a minion. If a minion died this turn, this costs (1). Witch's Cauldron: 3 Mana neutral common minion, 0/4. After a friendly minion dies, add a random Shaman spell to your hand. Duskfallen Aviana: 5 Mana Druid Legendary minion, 3/7. The first card each player plays each turn costs (0). 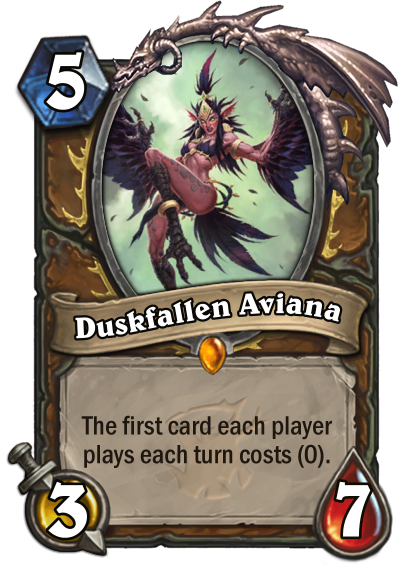 Duskfallen Aviana 5 3/7 The first card each player plays each turn costs (0). 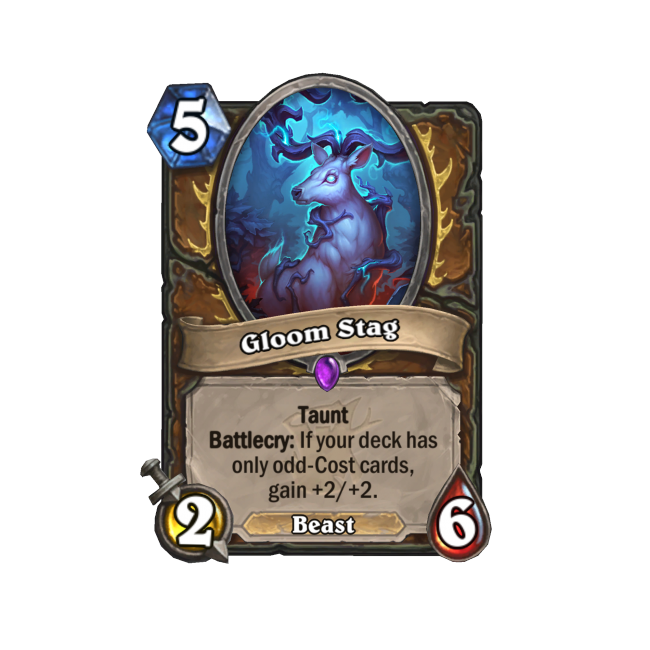 Gloom Stag 5 2/6 Taunt. Battlecry: If your deck has only odd-Cost cards gain +2/+2. 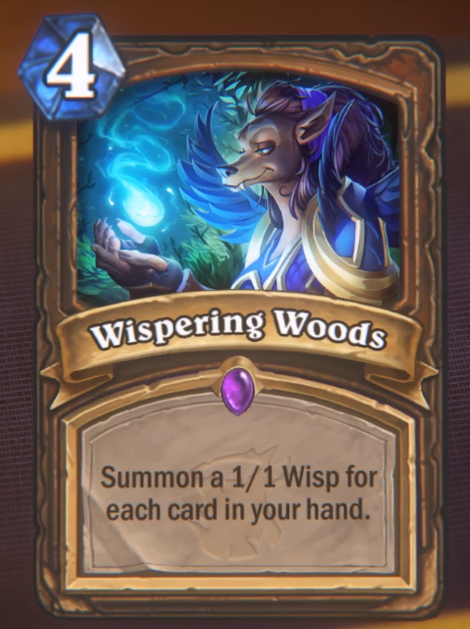 Wispering Woods 4 Spell Summon a 1/1 Wisp for each card in your hand. 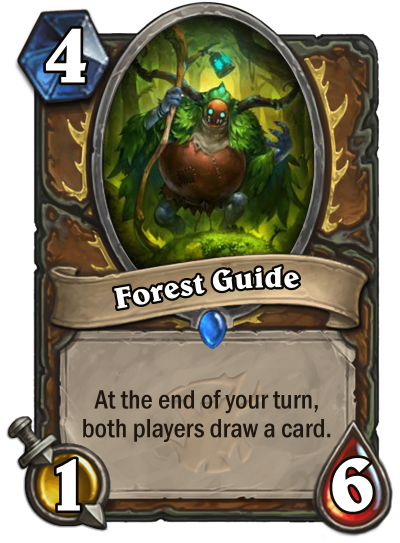 Forest Guide 4 1/6 At the end of your turn both players draw a card. 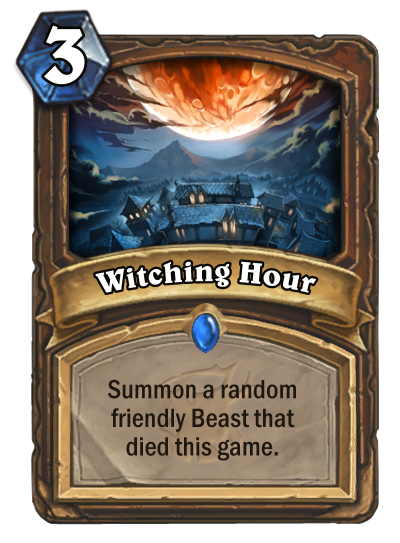 Witching Hour 3 Spell Summon a random friendly Beast that died this game. 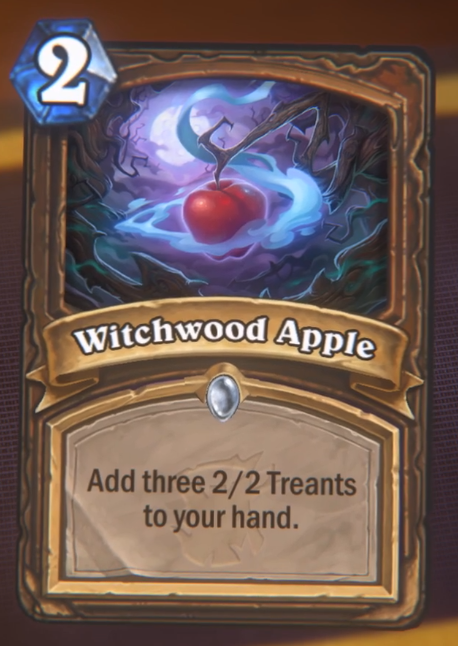 Witchwood Apple 2 Spell Add three 2/2 Treants to your hand. 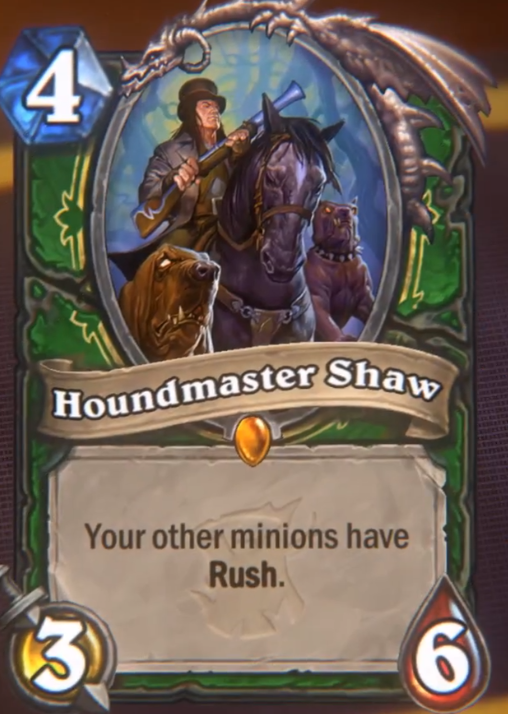 Houndmaster Shaw 4 3/6 Your other minions have Rush. 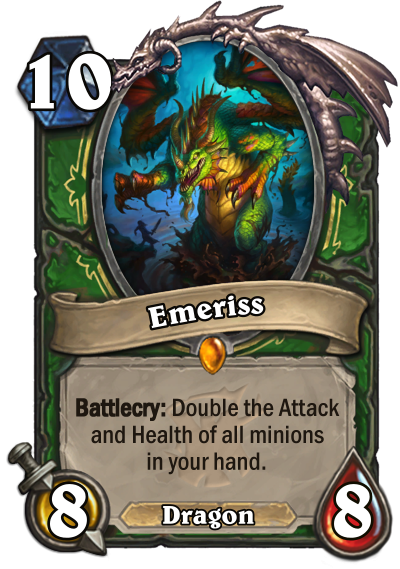 Emeriss 10 8/8 Battlecry: Double the Attack and Health of all minions in your hand. 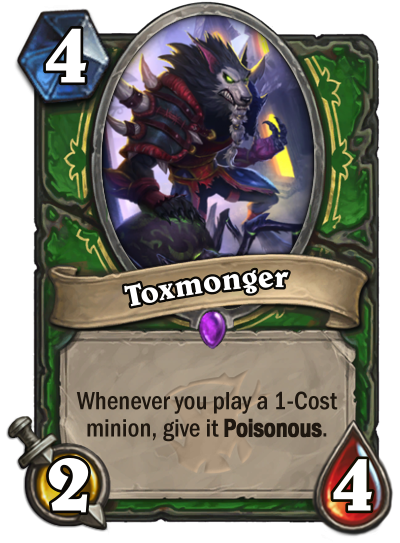 Toxmonger 4 2/4 Whenever you play a 1-Cost minion give it Poisonous. 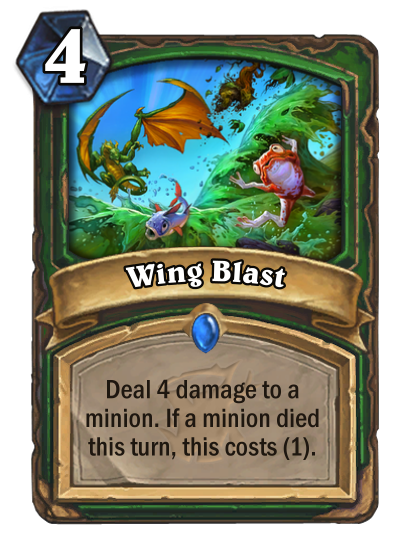 Wing Blast 4 Spell Deal 4 damage to a minion. If a minion died this turn this costs (1). 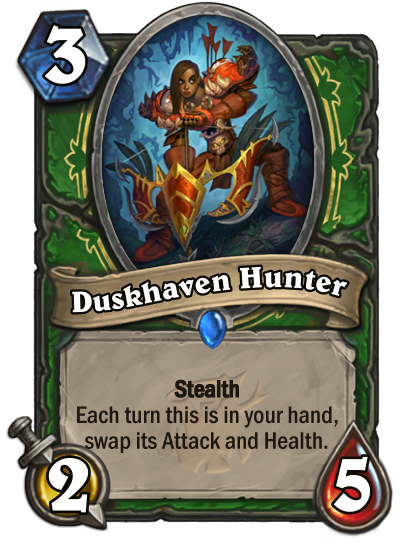 Duskhaven Hunter 3 2/5 Stealth. Each turn this is in your hand swap its Attack and Health. 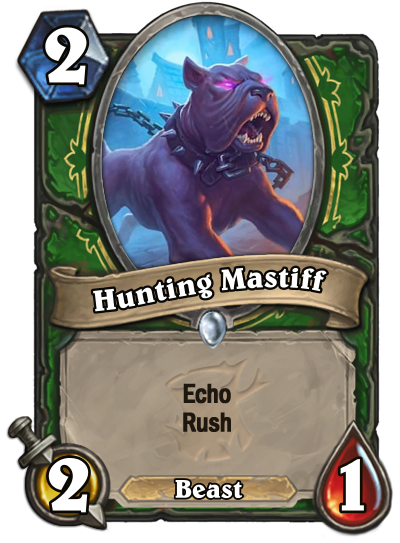 Hunting Mastiff 2 2/1 Echo. Rush. 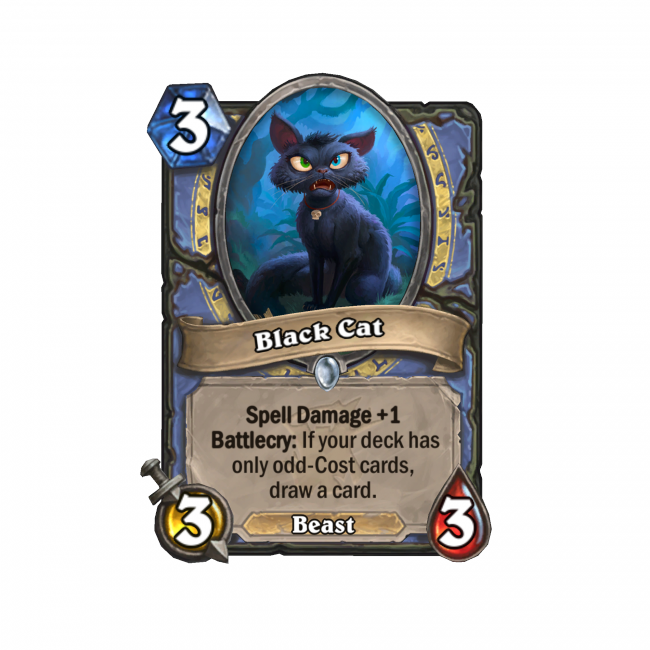 Black Cat 3 3/3 Spell Damage +1. Battlecry: If your deck has only odd-Cost cards draw a card. 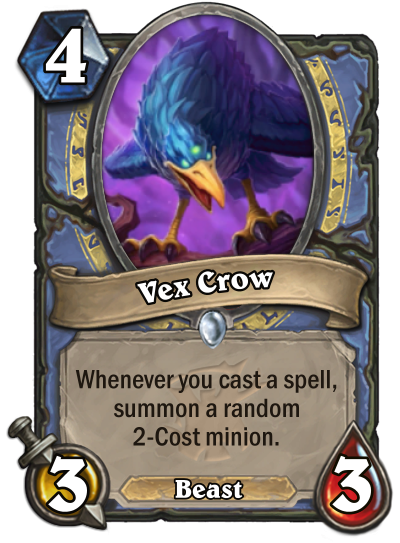 Vex Crow 4 3/3 Whenever you cast a spell summon a random 2-Cost minion. 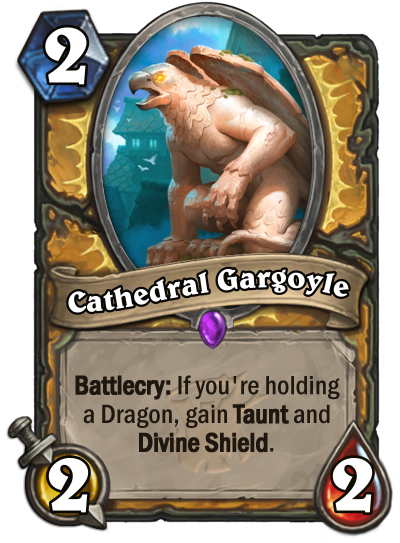 Cathedral Gargoyle 2 2/2 Battlecry: If you're holding a Dragon gain Taunt and Divine Shield. 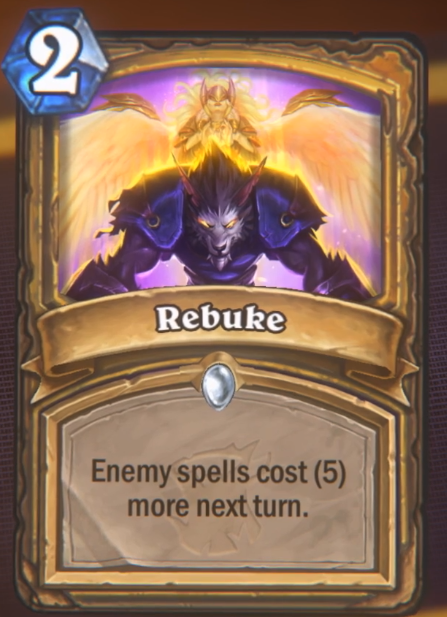 Rebuke 2 Spell Enemy spells cost (5) more next turn. Sound the Bells! 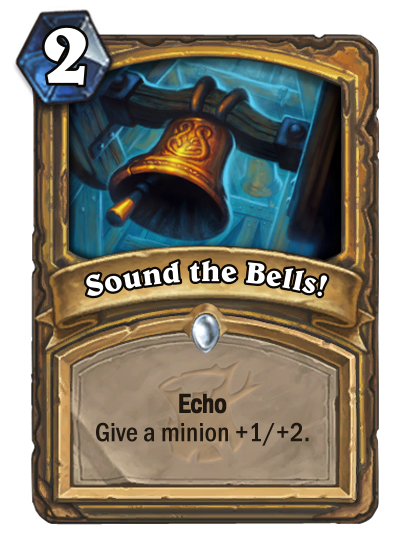 2 Spell Echo. Give a minion +1/+2. 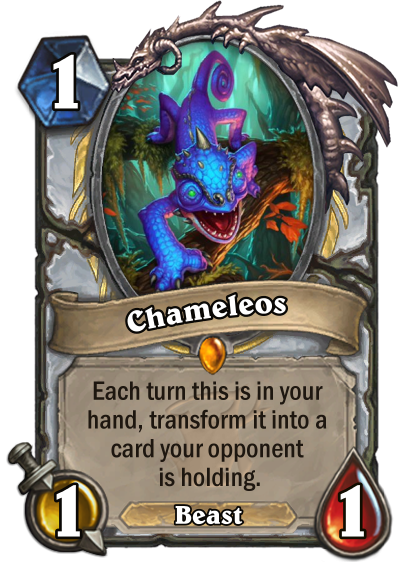 Chameleos 1 1/1 Each turn this is in your hand transform it into a card your opponent is holding. 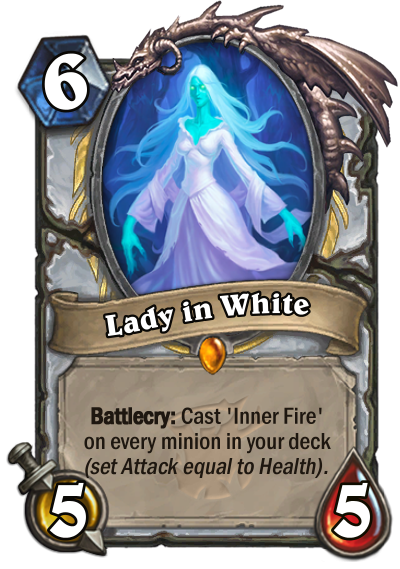 Lady in White 6 5/5 Battlecry: Cast 'Inner Fire' on every minion in your deck (set Attack equal to Health). 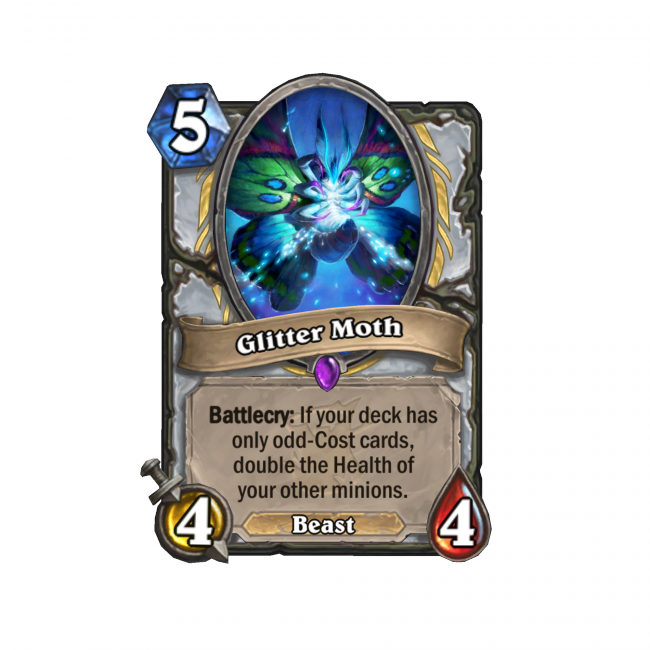 Glitter Moth 5 4/4 Battlecry: If your deck has only odd-Cost cards double the Health of your other minions. 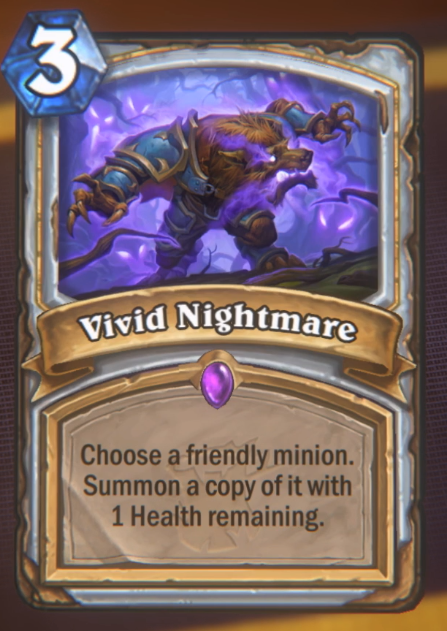 Vivid Nightmare 3 Spell Choose a friendly minion. Summon a copy of it with 1 Health remaining. 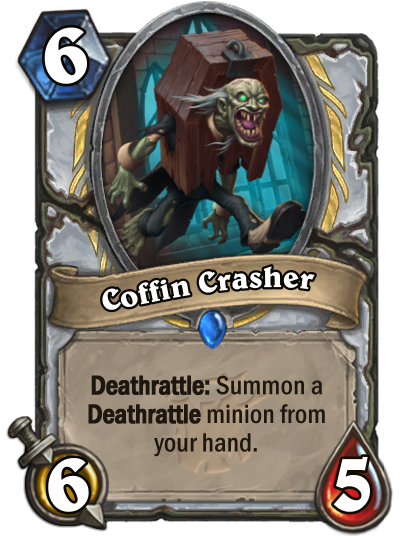 Coffin Crasher 6 6/5 Deathrattle: Summon a Deathrattle minion from your hand. 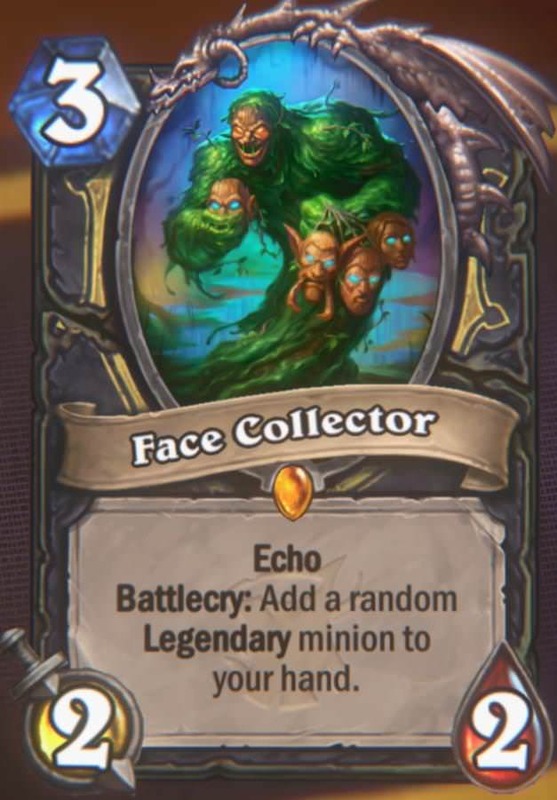 Face Collector 3 2/2 Echo. Battlecry: Add a random Legendary minion to your hand. WANTED! 4 Spell Deal 3 damage to a minion. If that kills it add a Coin to your hand. 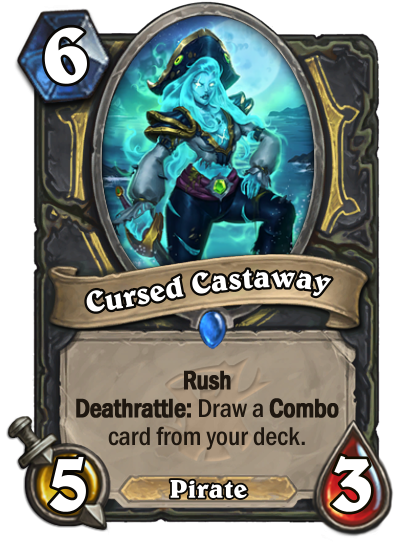 Cursed Castaway 6 5/3 Rush. Deathrattle: Draw a Combo card from your deck. 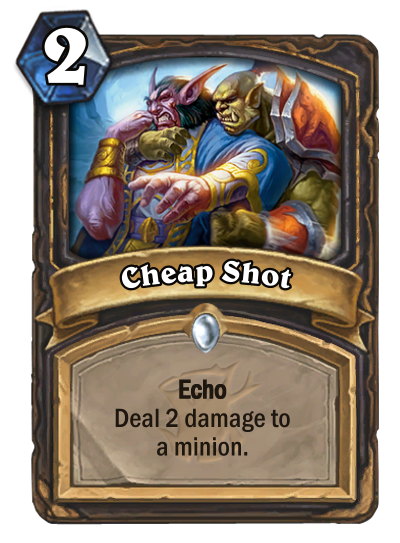 Cheap Shot 2 Spell Echo. Deal 2 damage to a minion. Hagatha the Witch 8 5 Armor Battlecry: Deal 3 damage to all minions. 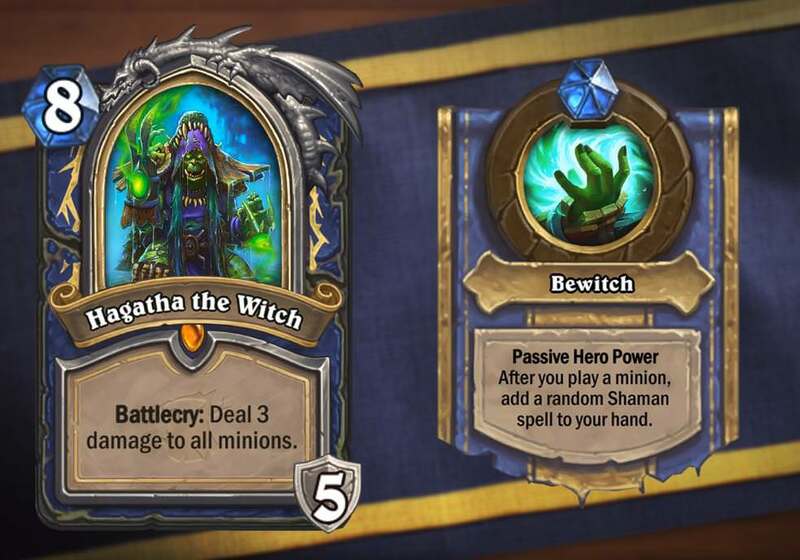 Passive Hero Power: After you play a minion add a random Shaman spell to your hand. 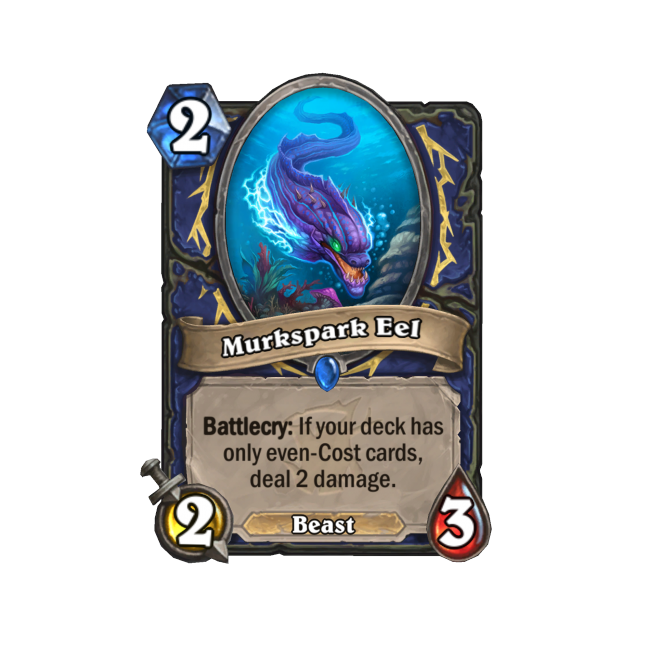 Murkspark Eel 2 2/3 Battlecry: If your deck has only even-Cost cards deal 2 damage. 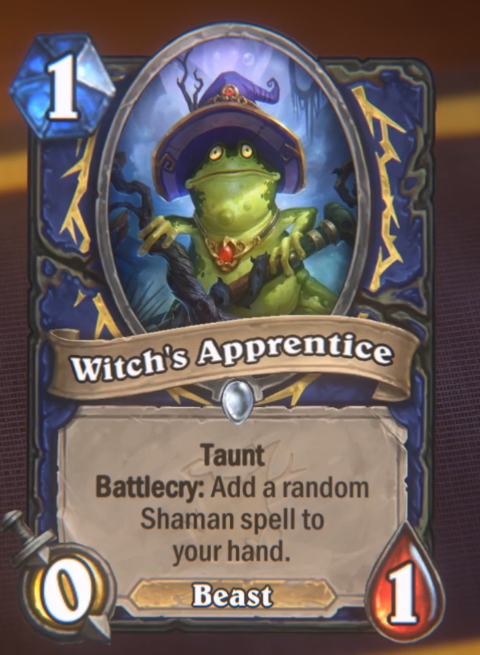 Witch's Apprentice 1 0/1 Taunt. Battlecry: Add a random Shaman spell to your hand. 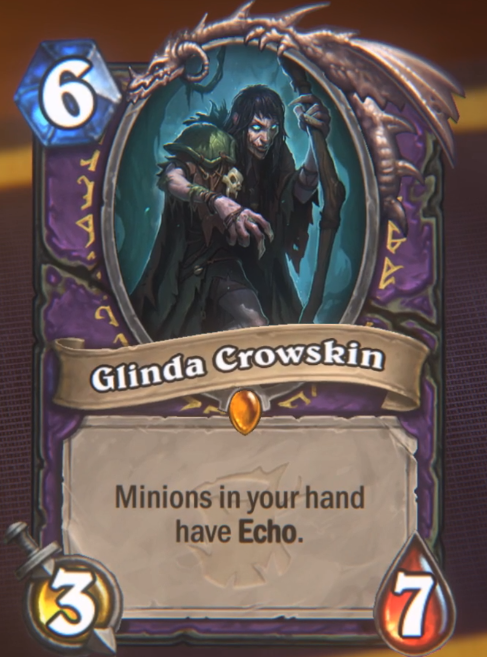 Glinda Crowskin 6 3/7 Minions in your hand have Echo. 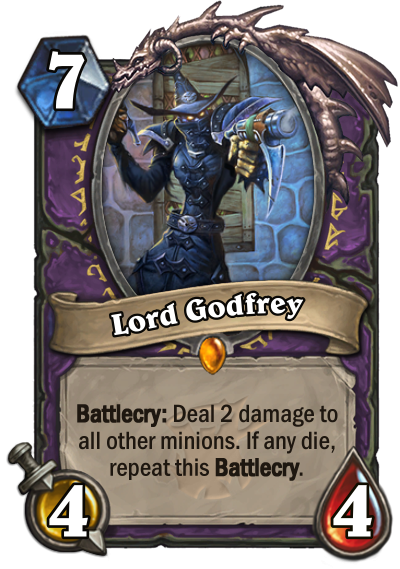 Lord Godfrey 7 4/4 Battlecry: Deal 2 damage to all other minions. If any die repeat this Battlecry. Darius Crowley 5 4/4 Rush. 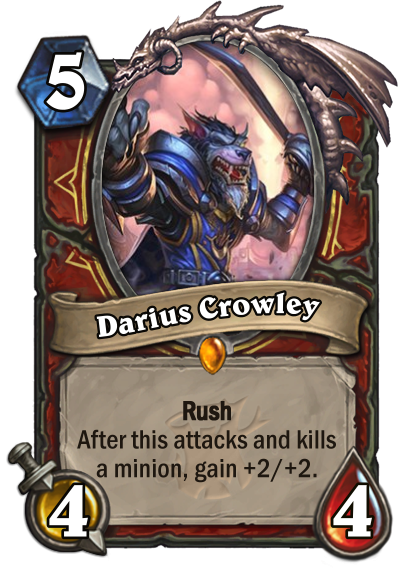 After this attacks and kills a minion gain +2/+2. 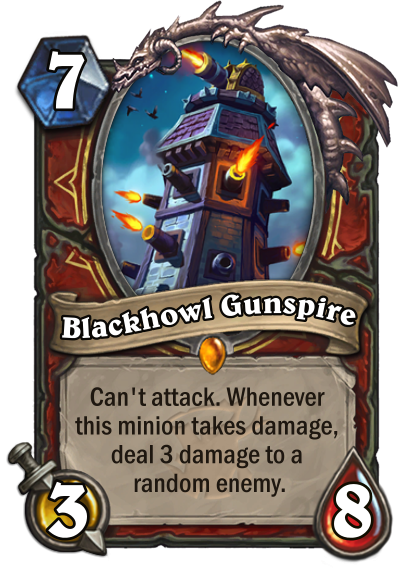 Blackhowl Gunspire 7 3/8 Can't attack. Whenever this minion takes damage deal 3 damage to a random enemy. 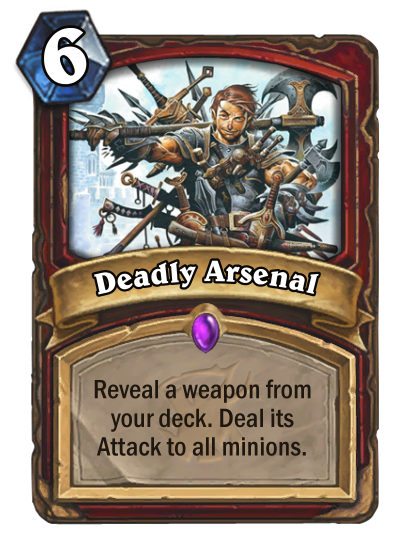 Deadly Arsenal 6 Spell Reveal a weapon from your deck. 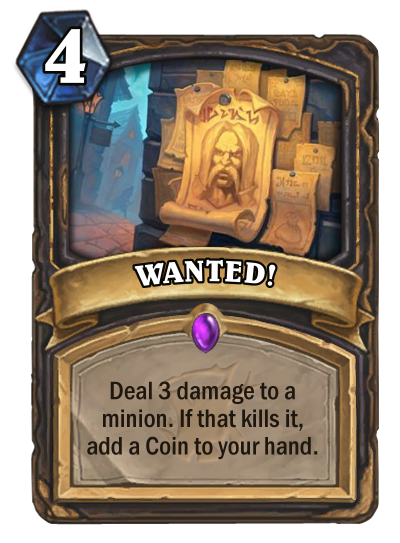 Deal its Attack to all minions. 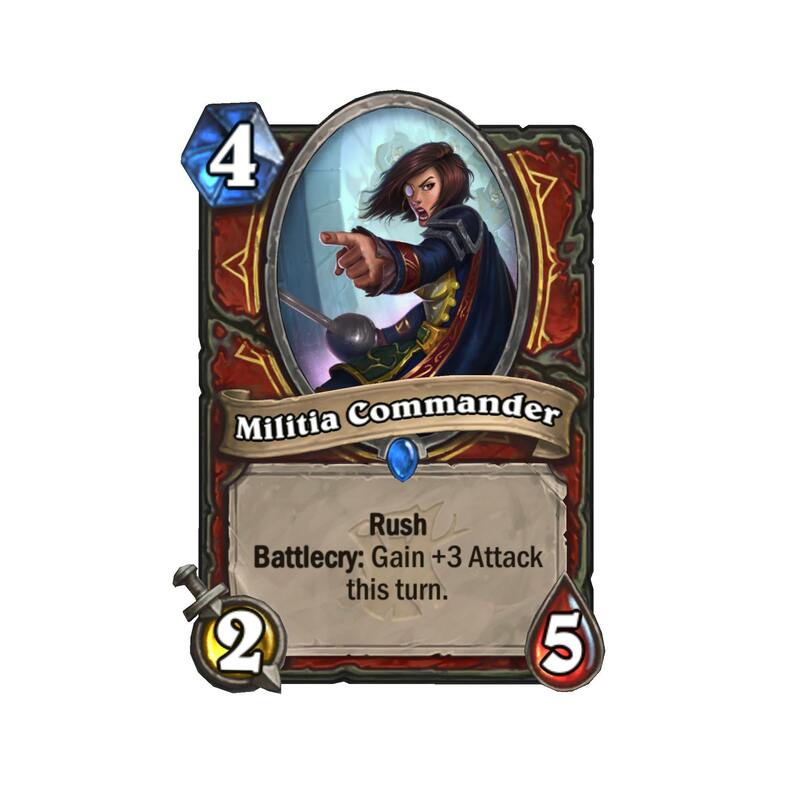 Militia Commander 4 2/5 Rush. Battlecry: Gain +3 Attack this turn. Redband Wasp 2 1/3 Rush. Has +3 Attack when damaged. 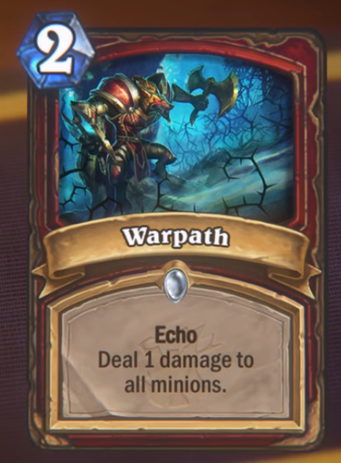 Warpath 2 Spell Echo. Deal 1 damage to all minions. 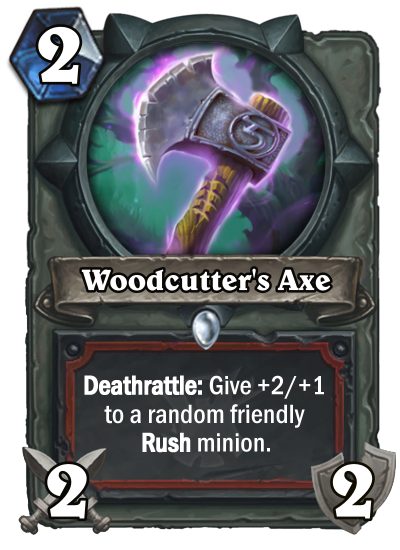 Woodcutter's Axe 2 2/2 Weapon. Deathrattle: Give +2/+1 to a random friendly Rush minion. 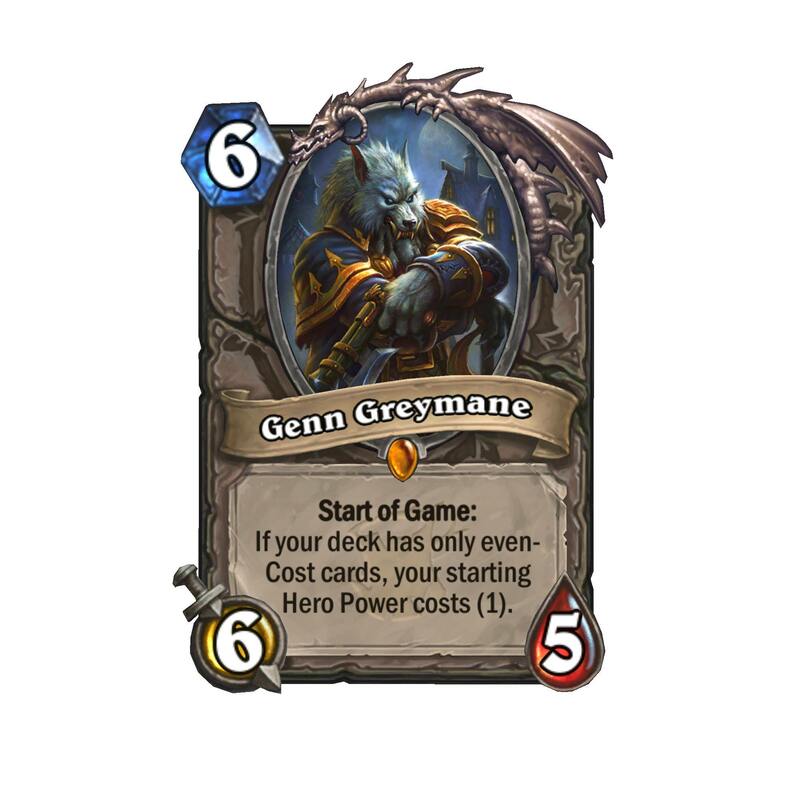 Genn Greymane 6 6/5 Start of Game: If your deck has only even-Cost cards your starting Hero Power costs (1). 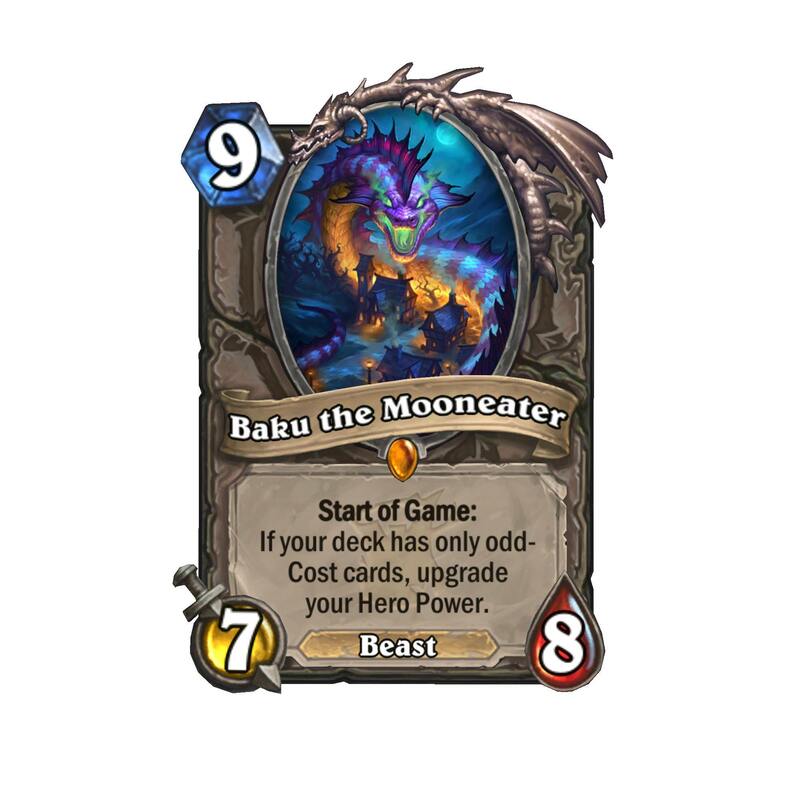 Baku the Mooneater 9 7/8 Start of Game: If your deck has only odd-Cost cards upgrade your Hero Power. Azalina Soulthief 7 3/3 Battlecry: Replace your hand with a copy of your opponent's. 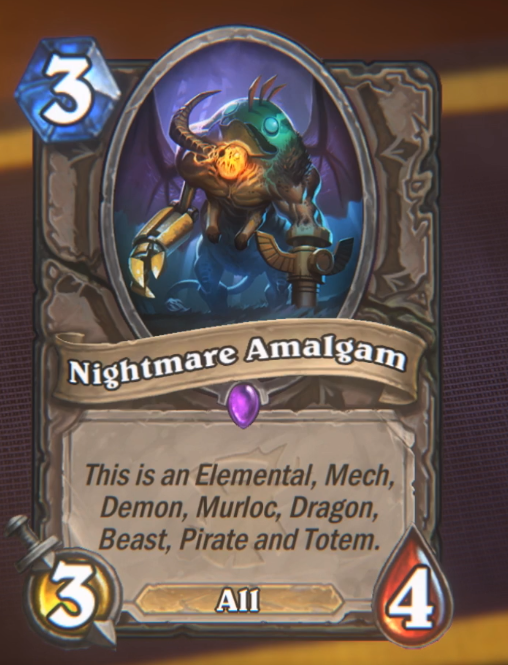 Nightmare Amalgam 3 3/4 This is an Elemental; Mech; Demon; Murloc; Dragon; Beast; Pirate and Totem. 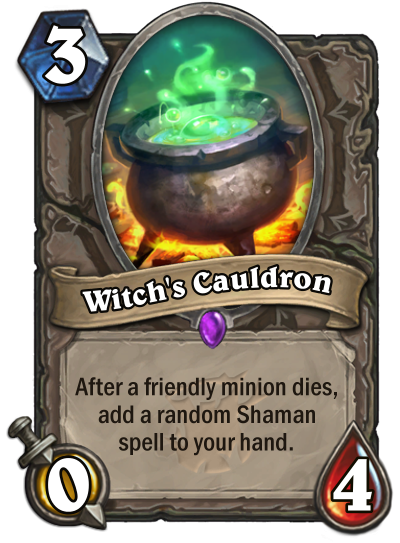 Witch's Cauldron 3 0/4 After a friendly minion dies add a random Shaman spell to your hand. 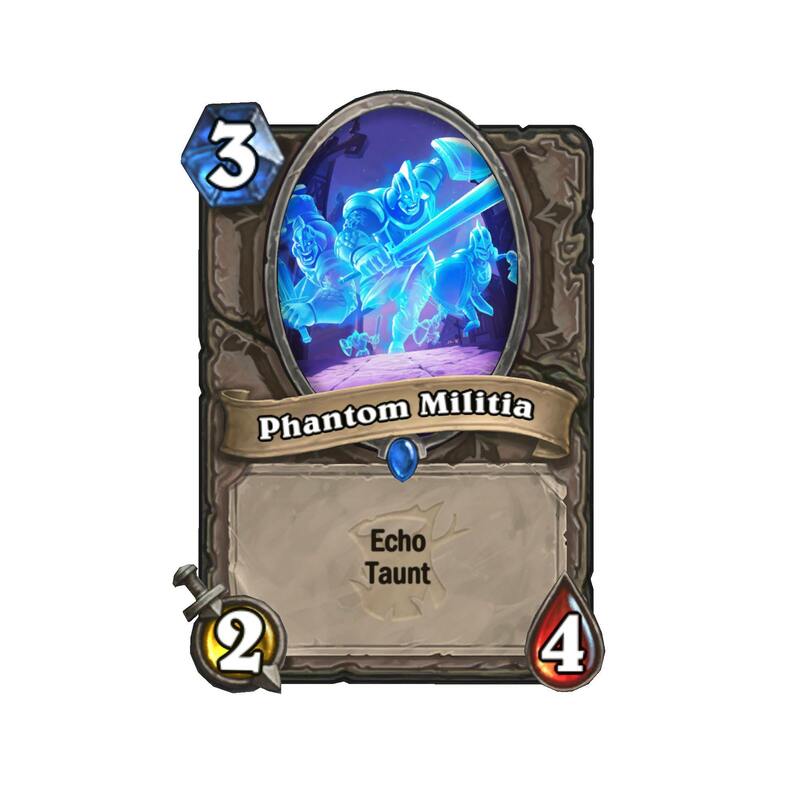 Phantom Militia 3 2/4 Echo. Taunt. 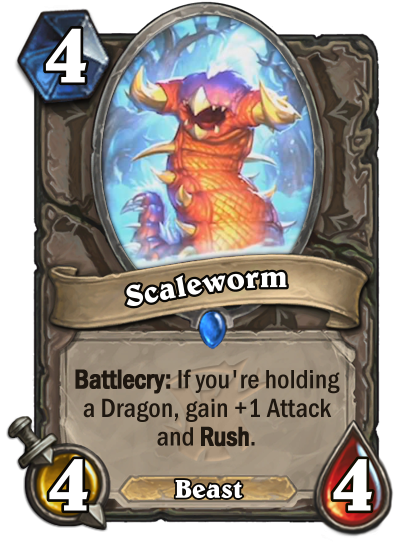 Scaleworm 4 4/4 Battlecry: If you're holding a Dragon gain +1 Attack and Rush. 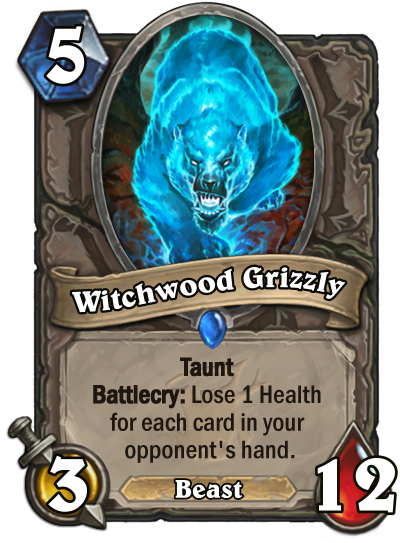 Witchwood Grizzly 5 3/12 Taunt. Battlecry: Lose 1 Health for each card in your opponent's hand. 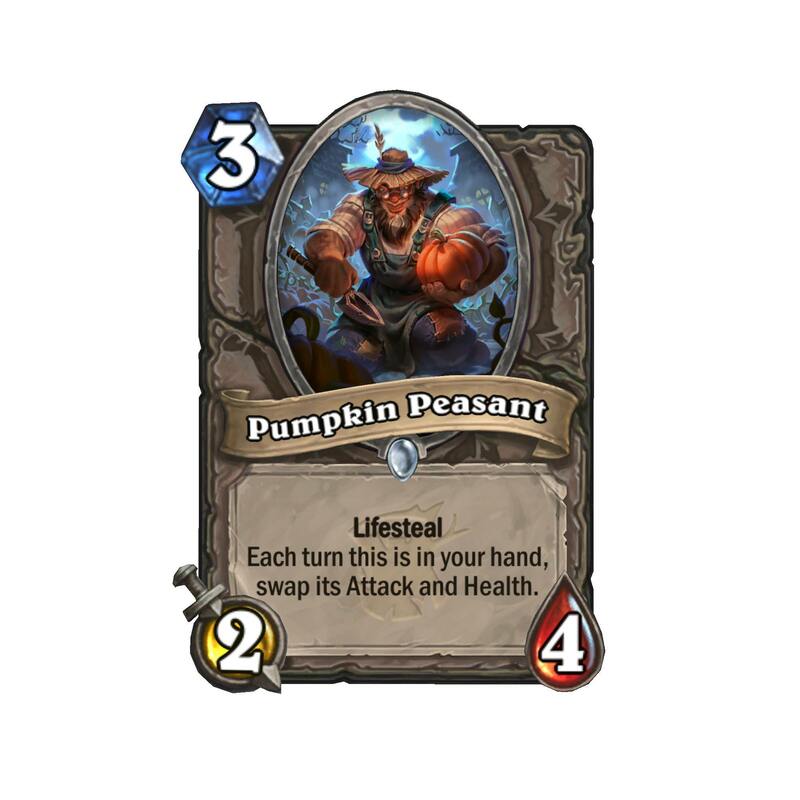 Pumpkin Peasant 3 2/4 Lifesteal. 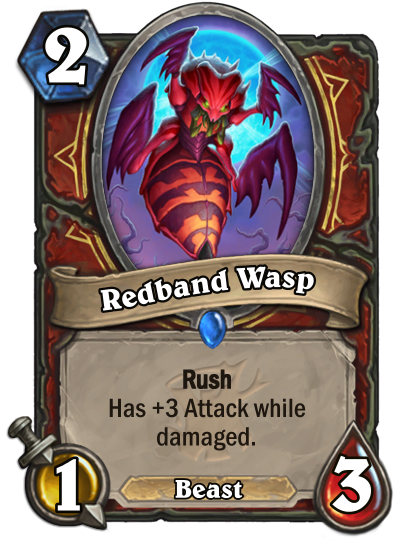 Each turn this is in your hand swap its Attack and Health. 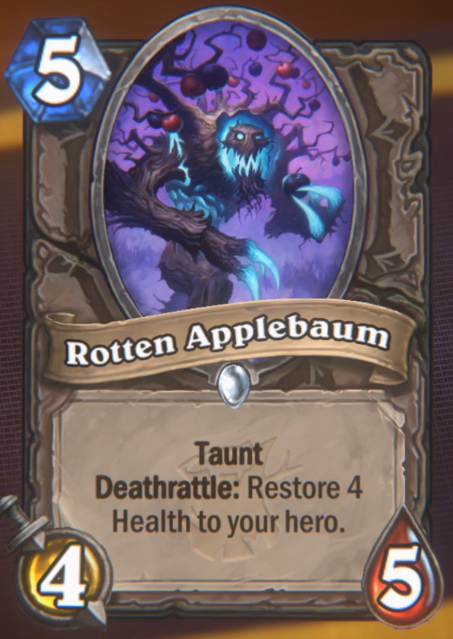 Rotten Applebaum 5 4/5 Taunt. Deathrattle: Restore 4 Health to your hero. 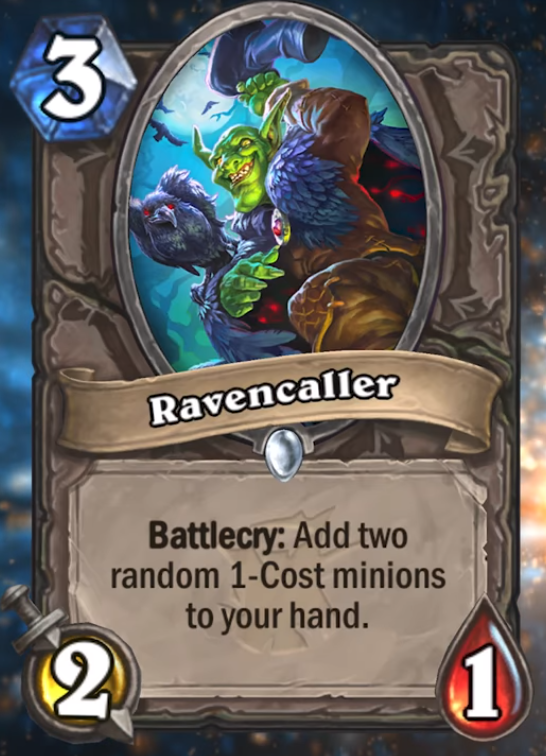 Ravencaller 3 2/1 Battlecry: Add two random 1-Cost minions to your hand.